Roughly 56 million K-12 students live in the United States. Most attend public schools, about 10% are enrolled in private schools, and a small number of students are of school age but do not attend a school. Within this wide diversity of students, summarizing their views on digital learning is challenging at best. However, our experience and some limited studies suggest several preliminary findings. All of the studies referenced below have some limitations and none are fully representative of the views of all students. Most are skewed towards students who have a higher than average exposure to and/or interest in digital learning. Still, these findings are valuable as they begin to represent the voice of students. students who are experiencing digital learning in their mainstream school. These findings below are drawn in part from a study that Evergreen conducted for the Foundation for Blended and Online Learning. Evergreen interviewed parents, school administrators, and teachers, and conduced focus groups with students. Evergreen also reviewed schools' data about the reasons that their students had chosen their school. These categories are overlapping and not mutually exclusive. Students may have health issues that lead to academic issues, for example. Each of these areas is explored in more detail below. Students who choose blended schools for academic reasons are often struggling and behind in credit accumulation. They are also often feeling disengaged from their mainstream school, often because they do not feel challenged, as explained in a report commissioned by the Bill and Melinda Gates Foundation. These students are frustrated that their traditional teachers must move at the pace of the class, which is slower than these students would like. Even when an individual teacher recognizes the issue and provides enrichment opportunities to the student, these options are often limited and inconsistent between classes. Other students who are not performing well academically feel that traditional school is “a bad fit” for them. Often the reasons for the bad fit have to do with the school’s social environment. For example, these students may be interested in academics and feel that the school culture is largely focused on sports and social events. Or they may feel that they are “lost” within a large school and would be more comfortable, and perform better, in a smaller school environment. Perhaps most interesting is that a subset of students demonstrates a combination of these factors, and sometimes all three. For example, the student who is particularly interested in creative and analytical writing may find that she has outpaced her school’s writing courses, leading her to lose interest in school generally and struggle with other subjects. When she moves to a school where she can pursue her interest in writing, she recognizes that she must also do well in math and science to get into college and improves her performance in all areas. Some students seeking a new school environment for academic reasons have done well in their previous school but want to progress more quickly, focus on specific subjects and go farther with courses in these areas than is possible in their traditional school, or perhaps graduate early and move on to college. These students are often particularly attracted by the opportunities to enroll in classes that grant college credit while still in high school. They allow students to make up ground if they have fallen behind in courses or credit accumulation. Students can work through courses more quickly than in a traditional school while still meeting course requirements and gain more credits in a year than they would at a traditional school. In addition, students are often able to start recovering a course as soon as they have fallen behind, sometimes in mid-year or even mid-semester, so they don’t have to wait until the following school year to get back on track. They often provide specific supports that address the reasons that students fell behind or dropped out of school. For example, schools that have a substantial number of students who are pregnant or parenting may provide day care and associated resources to support young parents. Online curriculum allows students to move through material at their own pace and especially to go more slowly through, or repeat, lessons that the student does not initially understand. Students who are ahead in their academic progression can take a nearly limitless range of online courses that expand their interests and knowledge in a specific topic area. Blended programs often have fewer students than traditional schools, and the smaller school environment is more comfortable for many students than larger schools. 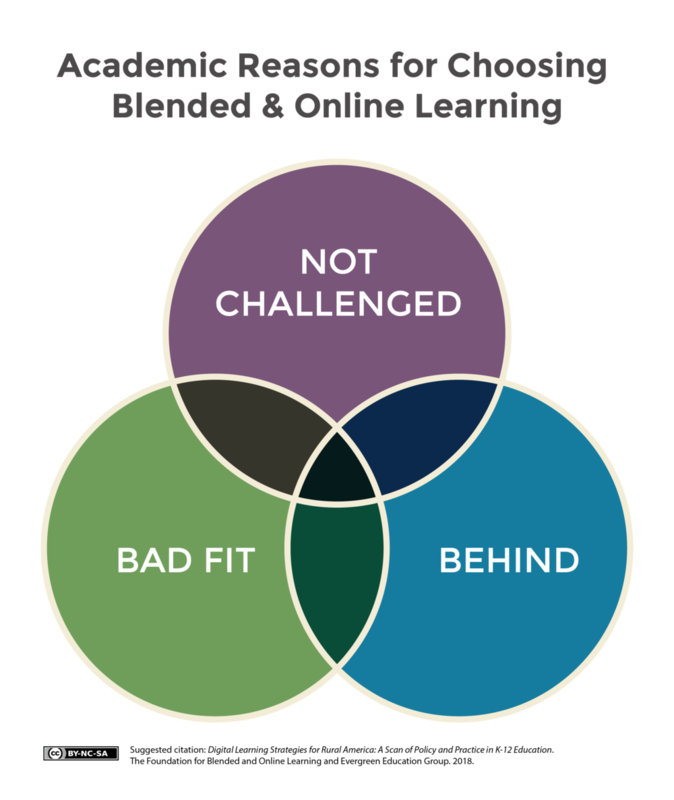 Students in blended and online schools may have health or social issues that make a flexible or new environment a better fit for them. These students may have a debilitating injury or a serious, long-term illness that makes attending a traditional school difficult. Some students are experiencing mental health issues such as anxiety or depression. These students’ situations range from diagnosed conditions for which they are under a physician’s care, to vague and/ or undiagnosed symptoms that are recognized primarily by the student and her family, and nevertheless require a different school environment to allow for academic success. A subset of these students has been bullied, which can rapidly lead to depression or anxiety and may cause students to seek a new school. A recent study found that just over a quarter (27%) of parents with children in online schools served by the country’s largest online school provider reported that they chose an online school because their child was bullied at his/her previous school. Of that group, 94% said that attending the online school has helped their child deal with the issue. 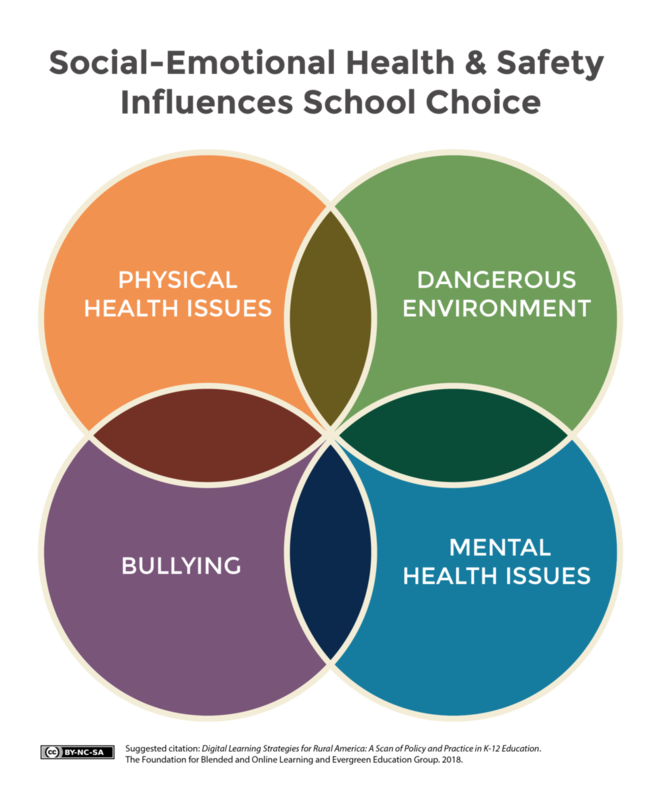 Bullying is an extreme example of a condition in which students feel that the traditional school social environment is not a good fit. Some students explain that they sought a school with a different social and academic climate, without explicitly stating that they were being bullied. Students who have experienced mental or physical illness or injury often have fallen behind academically. They may need a blended or online school to gain credits more quickly than would be possible in a traditional school and need a new physical environment and flexible schedule. Although it is not unusual for students who move into a blended school for health reasons to remain there even after their health condition has improved, some students—particularly those dealing with an injury—may seek to be in a blended or online school temporarily. District-run blended and online schools are often the best option for these students because the students can easily move between the online school and the traditional school. Some districts have begun aligning course progressions in both traditional and online courses to allow students to switch between the two without experiencing a major disruption to their studies, although many districts have yet to determine the best policies and practices for allowing students to move between schools. Accessing online courses from home or hospital allows students to stay on track, whether they are undergoing medical treatment, working through anxiety issues, or facing other challenges. Flexible course pacing allows students to rest when necessary to focus on their injury or illness, and work on their courses when they are feeling well. The student’s recognition of this flexibility helps with healing because it reduces stress. Imagine an ill student who thinks she must be up at 7am to attend her first period algebra class or risk not understanding a key concept and falling behind. If that same student knows that she can get the sleep required by her illness, and work with a teacher in the early afternoon, she is more likely to recover. Students who are struggling with health issues may be more easily able to focus on just one or two courses at a time, instead of five or so. Some blended and online schools allow students to follow a schedule in which they focus on one course until they complete it, before moving on to the next course. In this way, they may complete a standard course load in a school year, but on a different schedule than usual. Students often feel emotionally and socially supported by the greater individual attention that they receive from teachers and other adults in blended and online schools. Some of these students have felt “lost” in larger physical schools with larger traditional classrooms. No student is average in all ways; in fact, most students are distinct in many respects. All students have interests and circumstances that make them unique. Some of these students are better served by blended and online schools than by mainstream schools. A major component of this group is made up of students who are pursuing an activity that requires more time than is available if they are attending a mainstream school. Athletes practice for long hours and may want to compress their study time. They may have to travel long distances for competitions, making physical school attendance impossible. They may be following an outdoor pursuit such as skiing or surfing, which requires taking advantage of conditions at optimal times. No aspiring Olympic skier, for example, wants to wait until after school at 2pm to ski every week day. Similarly, students in dance, music, or theater often adhere to demanding practice and performance schedules that do not align with school schedules. Students who are making time for internships or jobs are a major second category. Some students have found a career interest and wish to pursue it before leaving high school; these students may want to spend substantial time at an internship or job that does not fit well with after-school and weekend hours. A student who wants to work with an accountant or financial advisor, for example, is well served by being at the work office during some school hours. Other students must spend a substantial amount of time working because they are financially supporting themselves or their families. Beyond these two common categories are countless additional circumstances that are unique to each student. Some students are traveling for enough of the school year that they need to enroll in an online school to continue their studies. Others move during the school year, and instead of switching physical schools will remain in an online school for the entire year. Some students who move between states discover that the new state has different graduation requirements, such that they must accumulate more than the usual number of credits in their remaining years—which may be more easily accomplished in an online school. A significant proportion of students in online elementary and middle schools were formerly homeschooled. Although the total number of children being homeschooled appears to be growing, parents sometimes switch from homeschooling to online public schools so that their children can learn from home while receiving instructional materials and support from teachers. A common progression is that parents feel fully capable of teaching their children when they are young, but as they move into upper grades with more challenging math and science classes the parents wish to have the support that an online public school can provide. The videos below were provided by students who received college scholarships from the Foundation for Blended and Online Learning.